There’s no one right answer. It’s the questions that are important. When I was up in Portland a couple weeks ago, I got to help host the TEDx Adventure: Tiny House Tour with Dee Williams (also my first tiny house interview 🙂 ). This was a follow-up to Dee’s powerful Dream Big, Live Small TEDx presentation in 2011. As everyone gathered at the charming POD49, comprised of two big houses and a tiny house all sharing a common backyard, Dee challenged the group to ask themselves, What is enough? Could you be happy with less? How do you want to live in community? 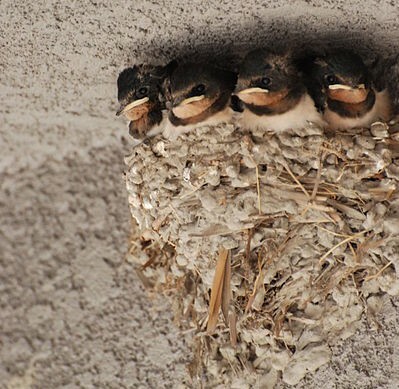 Living in community: cliff swallow co-housing. Credit: Oregon Department of Fish and Wildlife. Afterward, coffee in hand, I had some wonderful conversations with some of the attendees. One young woman told me that serendipitously she and twelve of her friends around the country had independently decided to move to Portland. She was interested in learning more about co-housing and creating an intentional community. Another woman had decided to redefine her family space. The mother of several teenage kids, she wants to build a tiny house in her backyard where she can live, leaving her big house to her kids and husband. By questioning traditional living arrangements, she had discovered what would keep her happiest yet still engaged with her family. Perhaps somewhere there is a sparrow dreaming of building a nest fit for an eagle. We don’t see much of that, though. Can you imagine the energy and resources it would take for the sparrow to pull it off? 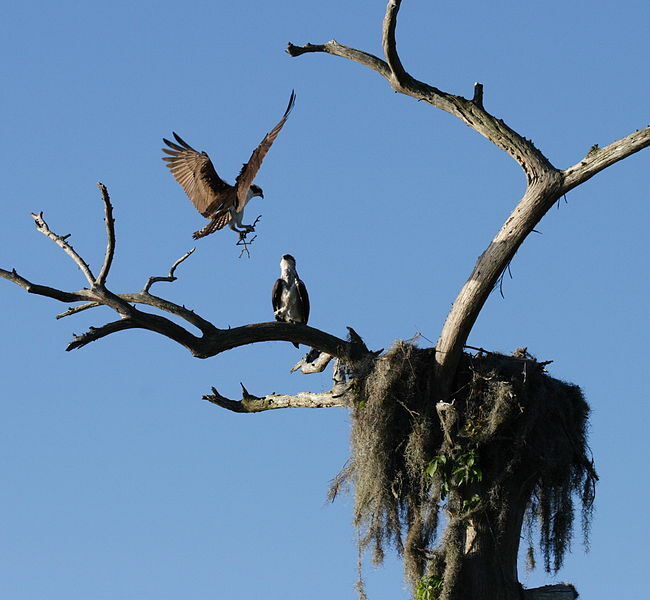 By the time the nest was done, breeding season would be long gone. Kind of defeats the purpose. Nature has an uncanny way of expending only as much energy as necessary to meet its needs. Has something changed in our biological makeup that makes us need more space than we did in the 1950s? Not unless you can chalk it up to super sized drinks or some genetic mutation we haven’t discovered yet. It’s our societal perception of what we need that has altered. The constant bombardment that “bigger is better”. Unfortunately, we rarely stop and question the messages we hear day in and day out, despite the resulting toll on the environment and our wallets. Or maybe we just haven’t seen enough viable alternatives. I spent a couple years in the high tech world and we talked a lot about “early adopters”. These are the ones most ready to jump on a new idea, a new gadget, a new program and try it out just because it’s cool and cutting edge. Most of the rest of the world is slower to fork over the cash, waiting to see if the new thing is really going to catch on, looking to see if people they know and respect are using it. If so, then they will jump on board, and so will their friends, and suddenly the new thing has gone from an out-there idea to a hot new trend to an accepted part of daily life. Marketing executives drool in their sleep over this. The diffusion of innovations according to Rogers. With successive groups of consumers adopting the new technology (shown in blue), its market share (yellow) will eventually reach the saturation level. Within the rate of adoption, there is a point at which an innovation reaches critical mass. There are whole fields of study around how public opinion changes. 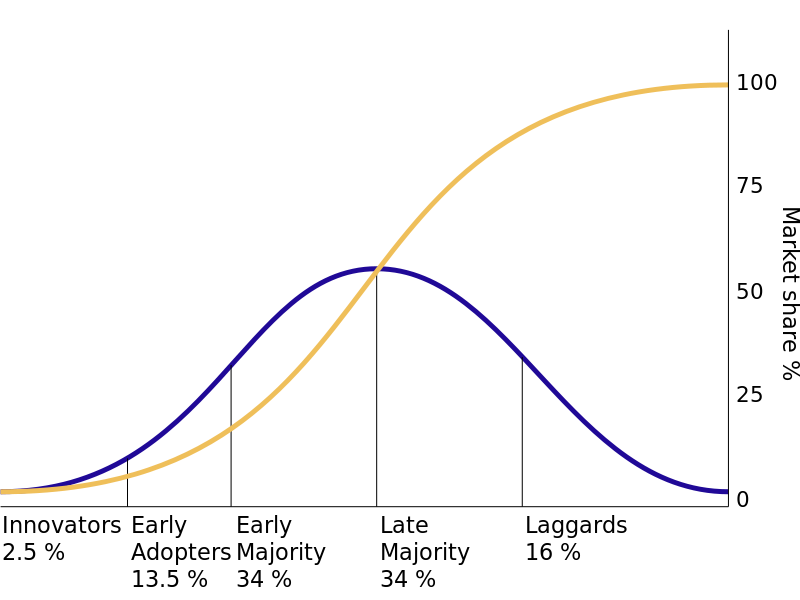 One of these is diffusion of innovations, a theory that seeks to explain how, why, and at what rate new ideas and technology spread through cultures. It’s best known by Everett Roger’s 1962 seminal work on the topic. Knowledge The individual is first exposed to an innovation but lacks information about it. During this stage of the process the individual has not been inspired to find more information about the innovation. Persuasion The individual is interested in the innovation and actively seeks information/detail about it. Decision The individual takes the concept of the change and weighs the advantages/disadvantages of using the innovation and decides whether to adopt or reject it. Implementation The individual employs the innovation to a varying degree depending on the situation. During this stage the individual determines the usefulness of the innovation and may search for further information about it. Confirmation The individual finalises his/her decision to continue using the innovation. This stage is both intrapersonal and interpersonal, confirmation the group has made the right decision. If you don’t have the innovators and early adopters out there showing something works, the rest of the world doesn’t know it’s an option. Once the average person on the streets does hear about it, they need to be able to get more information and work through whether it is right for them. This is why tiny housers are so important. They are the innovators and early adopters in a (hopefully) changing trend toward smaller housing. Through blogs, workshops, books and the media, they are providing information to show it can be done and the many benefits of living with less. They are leading by example, playing an important role in the dialogue. If there isn’t any alternative to larger and larger houses, the pervasive mindset will never change. No tiny houser claims everyone should live in 120 square feet. That’s not what it’s about. It’s about showing what’s possible. Sometimes you need to see examples of people doing something to the extreme to shift the center of public opinion in that direction. These leaders can be inspirational even if most people don’t follow exactly in their footsteps. Think about Gandhi, Mother Teresa, Neil Armstrong, Rosa Parks, or any of hundreds of women and men who point the way to what humans are capable of. While we may not be able to accomplish all that they did, we need them as role models to expand our horizons, to make us question how we choose to live our lives. So tiny housers, in their own small way, are pushing the envelope to define what is possible, to change people’s minds, to start new trends. Whatever the size of your house, you can help add momentum to the conversation while making choices in your own life that serve as examples to others. Become an honorary tiny houser. What is enough? Could you be happy with less? How do you want to live in community? It’s all about being more conscious and intentional in your choices. Really get to know yourself. Figure out what you truly need, not what society thinks you need (is it a need or is it a want?). Then the fun part comes, getting creative about how you can satisfy your needs. Once you’ve bucked society’s expectations, everything is possible. Let your imagination go wild. 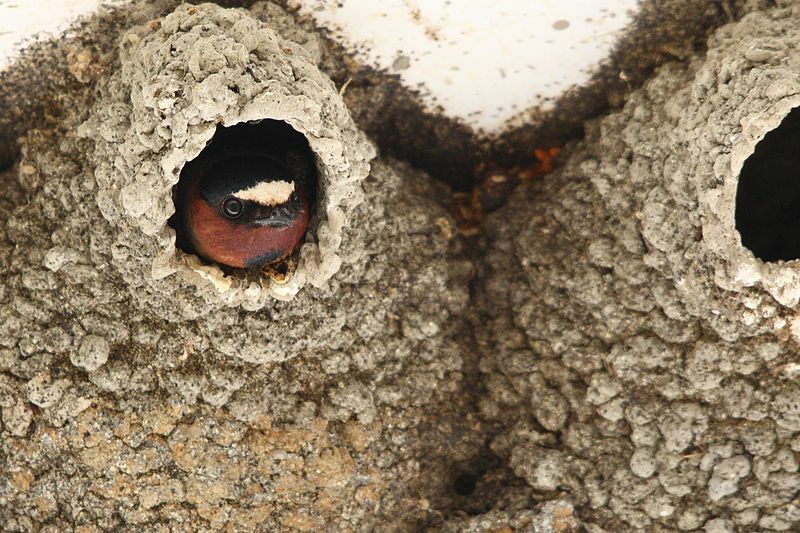 Your ideal nest size will start to take shape from there. 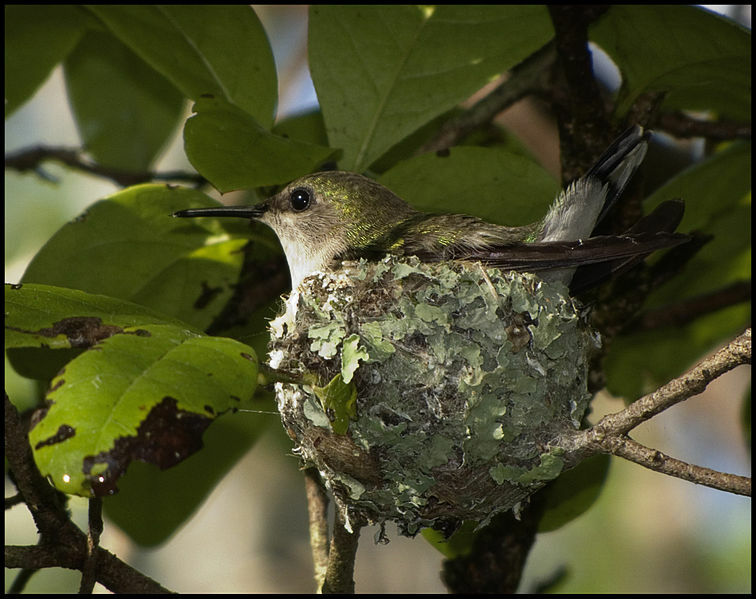 If you ask the right questions, your nest – whatever size is right for you – will fit like a well-chosen bra, um, glove. 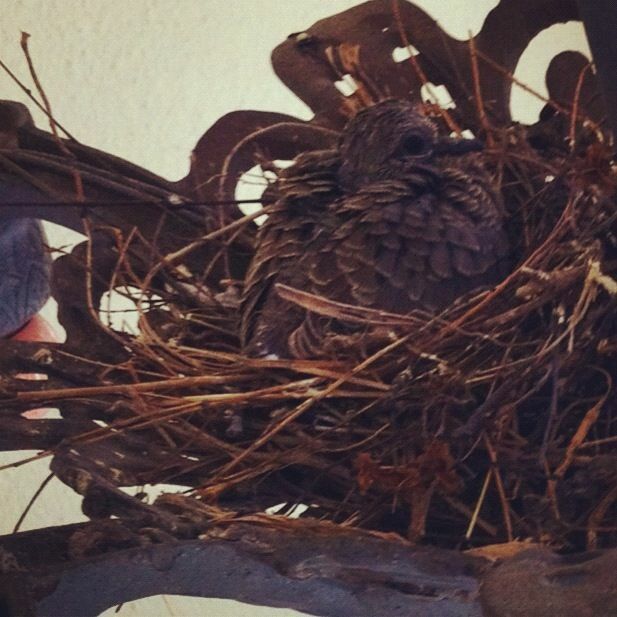 A nearly full grown mourning dove in my front porch light last year. 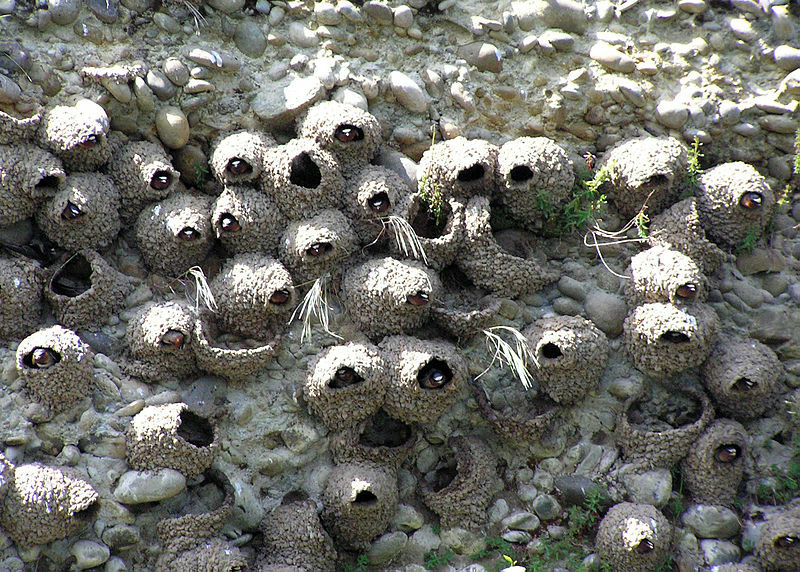 My nest size lightbulb came on when I added on to my house. I enjoy the new master suite so much I spend all my time there. And except for the kitchen it is everything I want… and still probably more than I need.